CanFin Homes Limited Recruitment 2017 2018 for 03 Manager & Assistant General Manager Posts Apply Online. CanFin Homes Limited Manager & Assistant General Manager Jobs Notification 2017 Released. 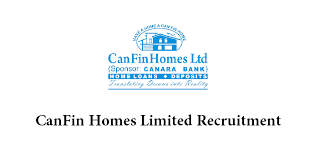 CanFin Homes Limited invites on-line applications for appointment in following Manager & Assistant General Manager post in CanFin Homes Limited Candidates are requested to apply on-line through Official website www.canfinhomes.com. The last date for submission of Online applications is 22.09.2017. Prospective candidates will have to apply before carefully reading the advertisement regarding the process of examinations and interview, eligibility criteria, Offline registration processes, payment of prescribed application fee/intimation charges, CanFin Homes Limited pattern of examination, CanFin Homes Limited Syllabus, CanFin Homes Limited Question Paper, CanFin Homes Limited Admit Date Release Date, CanFin Homes Limited Exam Date, CanFin Homes Limited Result Date etc. and ensure that they fulfil the stipulated criteria before Applying. 1. Assistant General Manager - Minimum 60% or Equivalent Grade in 4 years BE / B. Tech or Master Degree in Computer Science / Computer Technology / Information Technology or MCA (Master in computer Application) from a recognised University + 10 years of experience in relevant areas is mandatory. He/she should have worked in Banking-IT related areas/projects involving IT Policy and Planning/ Financial Networks and Applications/ Financial Information Systems/ Cyber Security Technologies/ Payment Technologies, etc., of which 5 ( five) years should be at senior /Middle management level.